Hasegawa produces the most readily available plastic kits in the market today. Not suprising, considering the size and resources of the company compared with other manufacturers of 1/72 armor kits. Their kits tend to be available at most decent hobby shops and mail order houses. Most of Hasegawa's kits date back to the early 1970s, and it shows. With a few exceptions, their kits are fairly simple, and the detail tends to be heavy, soft and sparse. Hasegawa does, however, produce several unique kits, and with a little scratch-building, superdetailing, and maybe the help of some aftermarket photoetched sets, build into good models. Their newest kits, from the Panzer IVs and newer, are excellent kits. Some of these kits were released under the Lindberg label, I believe during the late 1970s. An Asian company named "Science Treasury" (imported by LEE) has marketed several poor copies of Hasegawa kits during the late 1990s. 31028/MB 28 Railway Gun Leopold Same as Anzio Annie kit. 31033/MB 33 Karl w/Munitionspanzer IV Self-propelled version of the huge mortar. Karl is very good; well detailed. Tracks are vinyl and poorly detailed. Munitionspanzer is fairly crude. Comes with twenty-four figures in nine different poses. 31106/MT6 M3A1 Half Track Walls are too thick. Interior detail is sparse. Exterior detail is very good. 31107/MT7 M4A1 Half Track Walls are too thick. Interior detail is sparse. Exterior detail is very good. 31111/MT11 Sd.Kfz 7 8 Ton Half Track. Detail is a little heavy. Cab interior is sparse. 31112/MT12 Kubelwagen & BMW Motorcycle w/ Sidecar Interior of Kubelwagen is sparse, but exterior detail is very nice. Cycle is a little heavy in the detail. Rob Haelterman adds for the Kübelwagen: the wheels are underscale, the nose a bit too thick and the ribs under the nose are missing. The covers of the headlights are mounted higgledy-piggledy. No acetate is provided except for the windshield. 31118/MT18 Sd.Kfz 7 w/ 37mm AA Gun Detail on H/T is fairly heavy. Cab interior is sparse. Gun is not entirely accurate in the shape of the mount, and needs more detail. An older kit, but fairly decent nonethless. Good detail, but closed hull hatches, and single-piece vinyl tracks. Includes two figures. 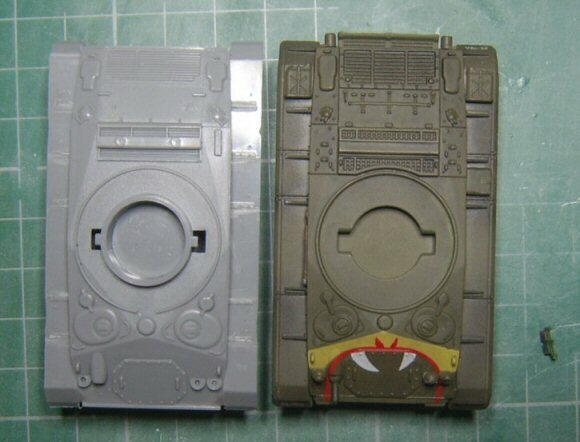 In this picture the Hasegawa kit (left) is compared with the Hobby Master prebuilt kit (right). As you can see just behind the turret are a set of louvres; the Hobby Master ones are the right length but whether the turret ring goes that far into them is another question, as pictures of this area are few and far between. However, in the Hunnicut book there is a picture that suggests the turret doesn't. Other than that, you can see that all the details are too soft and that the Hobby Master has the right layout. 31124/MT24 Armored Car Daimler Mk. II Assembled very easily, but could use some more, and finer, details. Overall, a fairly decent kit. 31136/MT36 Tiger I Late Production Steel wheels (good) and new turret roof on the same old, tired Tiger body. Not as good as Revell's Tigers. 31139/MT39 Tiger I Last Model Steel wheels (good) and new turret roof on the same old, tired Tiger body. Not as good as Revell's Tigers. 31151/MT51 Sd.Kfz 162 Jagdpanzer IV L/48 'Late Version' Excellent model. With the exception of the absolutely horrible tracks, this is better than the earlier ESCI kit. Basically the same kit as MT49, but with parts specific to the Late version of the L/48. 31162/MT102 Panther Ausf. G w/Zimmerit Coating Same as the early Panther G kit, but with resin replacement parts for turret and hull. These parts are the same as the old plastic ones, but with molded-on zimmerit coating. 31163/MT103 Tiger I Ausf. E w/Zimmerit Coating Same as the Tiger I "Late" kit, but with resin replacement parts for turret and hull. These parts are the same as the old plastic ones, but with molded-on zimmerit coating. 30025 Panther Ausf. G w/Zimmerit Coating Same as the Panther Steel Wheel kit, but with etched brass zimmerit coating from Eduard. 30026 Tiger I Ausf. E w/Zimmerit Coating Same as the Tiger I "Last Model" kit, but with etched brass zimmerit coating from Eduard. 30027 Sd.Kfz 162 Jagdpanzer IV L/48 'Early Version' w/Zimmerit Coating Same as Jagdpanzer IV L/48 "early" kit, but with etched brass zimmerit coating from Eduard. SP191 Flakpanzer V Coelian Hasegawa Panther Ausf. G kit with new resin turret and turned brass barrels. Appears to have been in limited release available only in Japan.